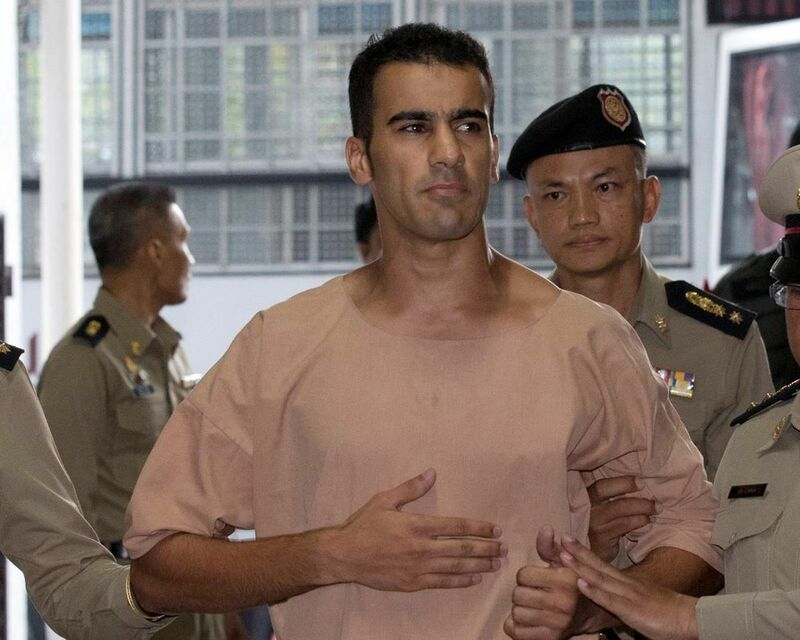 The Australian government has renewed demands for the release of Hakeem al-Araibi after the Thai prosecutor publicly confirmed the government has the power to set him free, regardless of the extradition process. On Monday the 25-year-old footballer from Melbourne, a Bahraini refugee, was remanded in prison for another two months after the Ratchadaphisek criminal court gave him 60 days to prepare a defence to Bahrain’s extradition request. On Tuesday evening the Australian prime minister, Scott Morrison, said seeing Al-Araibi in shackles had prompted him to write to Thai prime minister, Prayuth Chan-ocha, a second time, after first writing last week to call for Al-Araibi to be sent back to Australia. “I’ve written to him again, because I was very disturbed at the appearance of Hakeem at the hearing the other day,” Morrison told Sky News. “He was shackled and I thought that was very upsetting and I know it would have upset many Australians. The images, which were broadcast internationally, have also upset Thai people. Thai media is not allowed to show prisoners in restraints and local outlets including the Bangkok Post airbrushed the shackles out of pictures. “I think this is causing an outrage because a lot of international media are on this story and Thai people don’t want to see Thailand treating prisoners like this,” a senior Thai journalist said. The corrections department’s director general, Police Colonel Narat Sawatanan, said the restraints were not “shackles” because they could be locked and unlocked, and defended the decision to use them on Al-Araibi by saying there was a lot of public interest in the case. “It is our duty to transport prisoners to prevent them from fleeing,” he said. Al-Araibi fears he will be imprisoned and tortured as he alleges occurred in 2012 if he is returned. The Bahraini government bases its extradition request on an act of vandalism which occurred when, or very shortly after, he was playing in a televised football match, but Al-Araibi believes it is attempted political retribution. “The Thai government should see that Bahrain’s sole motive is to further punish Hakeem for the peaceful political opinions he expressed,” said an Amnesty International Thailand campaigner, Katherine Gerson. Supporters of Al-Araibi have stepped up calls for sanctions and boycotts primarily imposed by world sporting bodies such as Fifa and the International Olympic Committee against Bahrain and Thailand. “You cannot have the privileges of the international community if you are not prepared to live by its rules or behave by its standards,” said the head of Professional Footballers Australia, John Didulica. Speaking after the hearing, the Thai prosecutor confirmed that the country’s attorney general has powers of executive discretion and could return Al-Araibi to Australia at any point. Australia’s foreign affairs minister, Marise Payne, said the Australian government remained “deeply concerned by his ongoing detention” and continued to advocate “at the highest levels” in Thailand and Bahrain. “The Australian government reiterates its calls for the Thai government to release Hakeem al-Araibi home to Australia to be with his friends and family following his extradition hearing,” Payne said. Allan McKinnon, Australia’s ambassador-designate, would not be drawn on whether Australia was considering sanctions against Thailand if it failed to act. “What we are considering at the moment is anything we can do to more rapidly move Hakeem al-Araibi out of detention, have this case finished and allow him to go back to Australia,” McKinnon said outside the court. He said Australia and the other 14 countries represented in court to support Al-Araibi would “continue to press”. Pressure on Thailand is increasing, and its head of immigration, Surachate Hakparn, personally responded to criticism of Al-Araibi’s shackles and bare feet at court on Monday. Hakparn replied to numerous tweets to say it was in line with international standards something disputed by human rights groups. The posted comment, on behalf of McKinnon, said the actions of Bahrain had put Thailand “in a very difficult position”. The role of Australian authorities in Al-Araibi’s arrest has become a key question, and supporters have said that while they are now concentrating on getting him released, they would seek accountability when the ordeal was over. He was arrested in November on an Interpol red notice, issued against Interpol’s refugee protection policies. Australian federal police, working as locally based Interpol, notified Thailand of his arrival a process that is understood to be largely automatic when someone subject to a red notice is travelling and did not flag his refugee status. Al-Araibi has said he asked Australian government officials if he was safe to travel and was told he would be. Speaking to 2GB radio at the weekend, Morrison suggested Al-Araibi bore some responsibility. While Payne and diplomatic staff have lobbied on behalf of Al-Araibi since his arrest, Morrison personally intervened only last week, speaking to the Thai ambassador and writing to the Thai prime minister. He told 2GB he was yet to receive a reply.